Gallia Academy freshman Zane Loveday delivers a pitch during the fifth inning of Wednesday night’s non-conference baseball game against Athens at Bob Eastman Field in Centenary, Ohio. CENTENARY, Ohio — Good luck convincing Athens that the Blue Devils’ ace left early. Senior starter Josh Faro worked an inning before removing himself due to a stiff elbow, then freshman Zane Loveday held visiting Athens in check over the final six frames while guiding the Gallia Academy baseball team to a hard-fought 2-1 victory on Wednesday night in a non-conference matchup at Bob Eastman Field in Gallia County. Faro tossed only 13 pitches in his one inning on the mound, recording a single strikeout while allowing a pair of baserunners that were ultimately stranded at first and second. 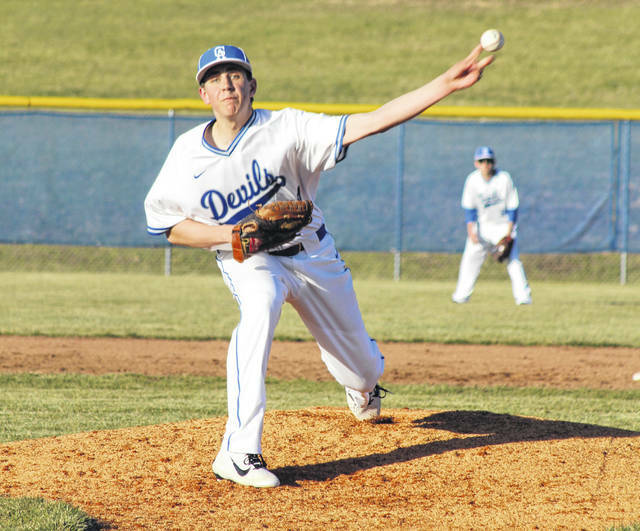 The host Blue Devils (2-0) — who went down in order in the home half of the first — turned to Loveday on the mound, a southpaw making his varsity debut against a rather potent Bulldog lineup. Loveday surrendered only one unearned run in the top of the third and allowed only one hit over six frames, all while recording 11 strikeouts to go along with just two walks. Loveday fanned at least one batter in every inning he pitched except the third, and the freshmen also produced multiple strikeout victims in the second, fourth, fifth and seventh frames. Loveday also struck out the side to end the game in the seventh. 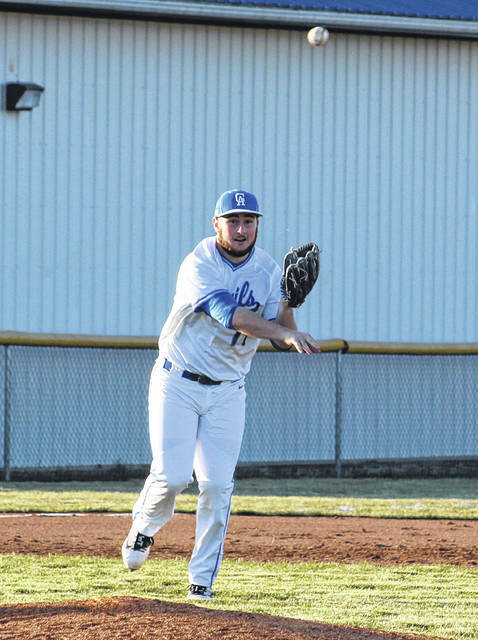 Gallia Academy — which produced only three baserunners after the second inning — made its big offensive push in the bottom of the second as a pair of two-out singles by Dakota Young and Morgan Stanley gave the hosts runners at first and second. Brendan Carter followed by reaching safely on an error that loaded the bases, then Cole Davis drew a walk in the nine-hole and allowed Young to trot home for a permanent lead at 1-0. Wyatt Sipple followed by reaching on an infield error that allowed Stanley to cross home plate for a 2-0 advantage. AHS, however, countered in the third as Jack Cornwell and Nate Trainer led things off by reaching on consecutive errors, then Cornwell scored on a groundout by Rece Lonas to cut the lead in half at 2-1. The Green and Gold mustered only two baserunners the rest of the way, and the guests ultimately stranded runners at second and third at the end of the third frame. First-year GAHS skipper Justin Bailey admitted afterwards that it was a tough situation to put anybody, but the freshman proved to be more than capable of handling the situation. “We lose Faro after the first inning and we basically had to scrap the whole game plan. You turn to a guy that is making his first varsity appearance and he’s facing one of the toughest teams in the district,” Bailey said. “Zane didn’t try to do too much and he trusted both his stuff and his teammates, and that was probably one of the best performances that I have ever seen here at home. The moment wasn’t too big for him tonight. Gallia Academy produced three of the four hits in the contest and also committed four of the six errors in the game. AHS stranded seven runners on base, while the hosts left five on the bags. Cornwell was the losing pitcher of record after surrendering two unearned runs, three hits and three walks over six frames while fanning four. Young, Stanley and Andrew Toler had the lone hits for the Blue and White, with Davis producing the team’s lone RBI. Nick Barfa had the lone hit for Athens with two away in the top of the fourth. Gallia Academy returns to action Saturday when it hosts Jackson in a non-conference matchup at 11 a.m.